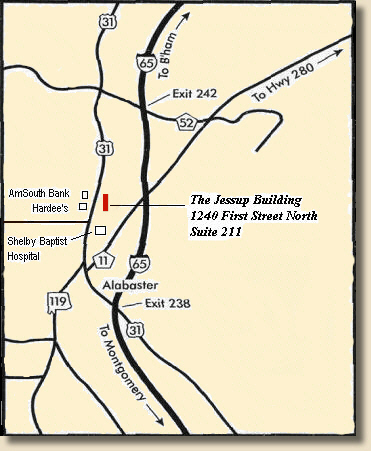 Take exit 238 (Alabaster/Saginaw) from I-65 North and turn left onto Hwy 31. Go north on 31 approximately 2.2 miles. The Jessup Building will be on your right across from Jack's Hamburgers. Take exit 242 (Pelham/Helena) from I-65 South and turn right onto Hwy 52. Go to Hwy 31 and turn left. Go approximately 1.7 miles. The Jessup Building will be on your left across from Jack's Hamburgers.